Eli Lev is a rare breed of artist. I started working with him in June if 2017 and immediately I knew he was going to get to making a full time living from music very fast – and he did it in under 18 months. 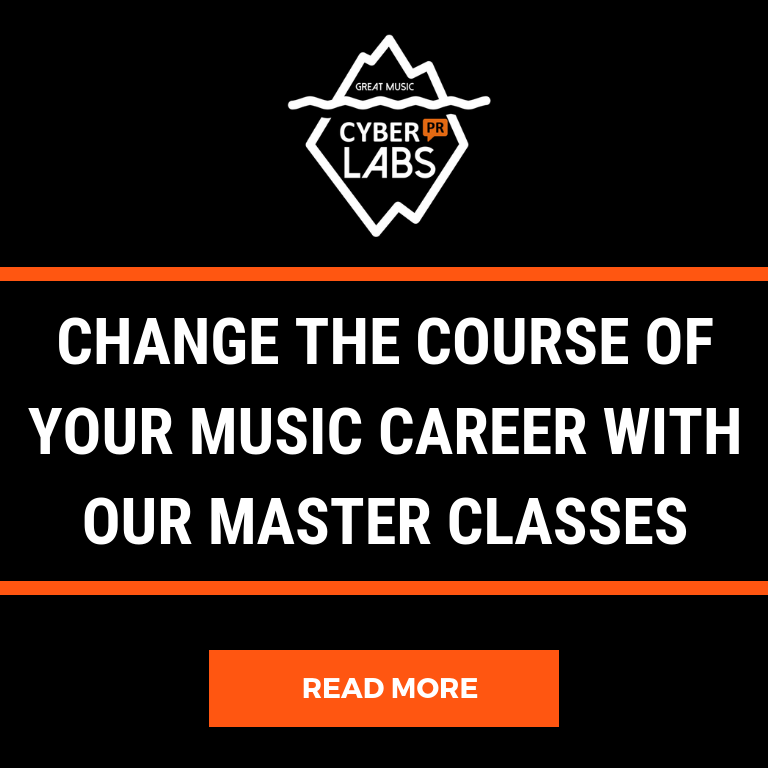 We have worked together to identify what is missing from all the musician training out there and Eli teaches LAB 5, his masterclass from an artists perspective. 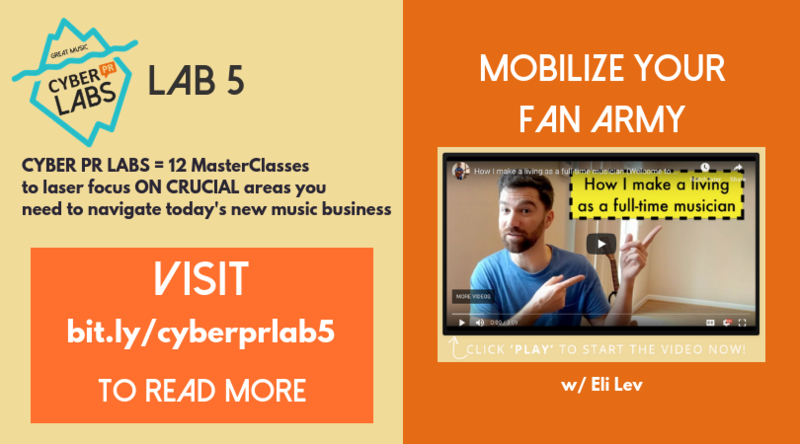 I sent him some interview questions about his career and some of the things he has learned along the way and he graciously answered – this is a preview of what you will get in LAB 5 – Mobilizing Your Fan Army AKA How to make a living as a full-time artist. When he says “It took some time for the universe to come together and make that happen” but I beg to differ. This is a man who very deliberately focused on what he wanted and worked towards that goal. Another favorite quote is “a PR firm is a leg on the table” and he describes that PR needs to work in conjunction with other things like – website, social media and live performances. Ariel Hyatt: Tell us a little about yourself. Eli Lev: I started music full-time about two years ago. Last year I made Eli Lev Music, LLC. It’s been quite the process. So far, I’ve got two albums out, do live shows, and that sustains me as a full-time musician. It’s a really cool thing. Cyber PR has been a really big part of getting my career to the next level, so I’m really happy to be involved with them. AH: Being in the folk genre, but figuring out your own way to make a path for yourself, what would you tell an artist who is starting out in the music industry and trying to find their “path”? EL: I feel like we are post-genre now, so you can mix and match where our audience lies. It’s almost by demographic more than genre. Who are your people? Are they educated? Are they travelers? Business folk? Punk-rockers? What clothes do they wear? That stuff can be just as important as genrefying your music. For me, it’s just finding your message as an artist and as a story and then all of that stuff creates your persona. It’s not just the music anymore. AH: When did you decide you wanted to be a full- time musician, and what was your first course of action after this decision? EL: I decided to be a full-time musician on a beach in Mexico near Sayulita. I picked out the beach on Google Maps in Indiana. I brought my guitar, started playing some songs, and thought “If I’ve ever going to do this creative thing it’s going to be now.” It took some time for the universe to come together and make that happen but eventually it did so here I am. AH: From an artist’s perspective, how do you know how personal is too personal when writing your signature story/ figuring out your personal brand? EL: I think each of us have our personalities that we present online that we’re comfortable with. I think that’s different for each person. I feel comfortable sharing my journey about my music and my creative part. I don’t really share day-to-day stuff, like what I had for breakfast. I separate that part from my social presence. But, I am myself on social media. I don’t have this other persona. I care a lot about what people think about the music and I like to comment and respond to people when they show some love to me. It really depends on the person. AH: What is one piece of advice you would give a beginner who doesn’t have a solid fanbase yet, and is not sure where to start to build one? EL: Open up your phone. Open your contact list. There is your fanbase. There’s where you start. Your friends and family, people you work with. The people that are closest to you are going to be your community and strength. For me, I built out from there. My patreon page came from that, local artists, people who I work with, all comes from people I already knew. AH: How does an artist figure out what their “story” is? How do you know if it will resonate with potential fans? EL: I think your story is always developing. Wherever you’re at, that’s your story. If you’re a beginning artist and you have one song that you’r ereally proud of, your story is “hey, this is my first song, and I’m really excited about it.” If you’re a professoinal musician who’s performed everywhere, that’s your story. It’s not about having an aura or presenting yourself as something that oyu’re not. People will see that very quickly. Being true to yourself is the first step. AH: A common misconception for beginning artists is that all they need to do is hire a PR firm and they will have immediate success, what do you think about this? EL: Nope, that’s not true. A PR firm is a leg on the table, you could say. As long as you’ve got all your things in order – website, socials, shows, recorded music. When you’re looking for that next step that’s when PR can make a difference. 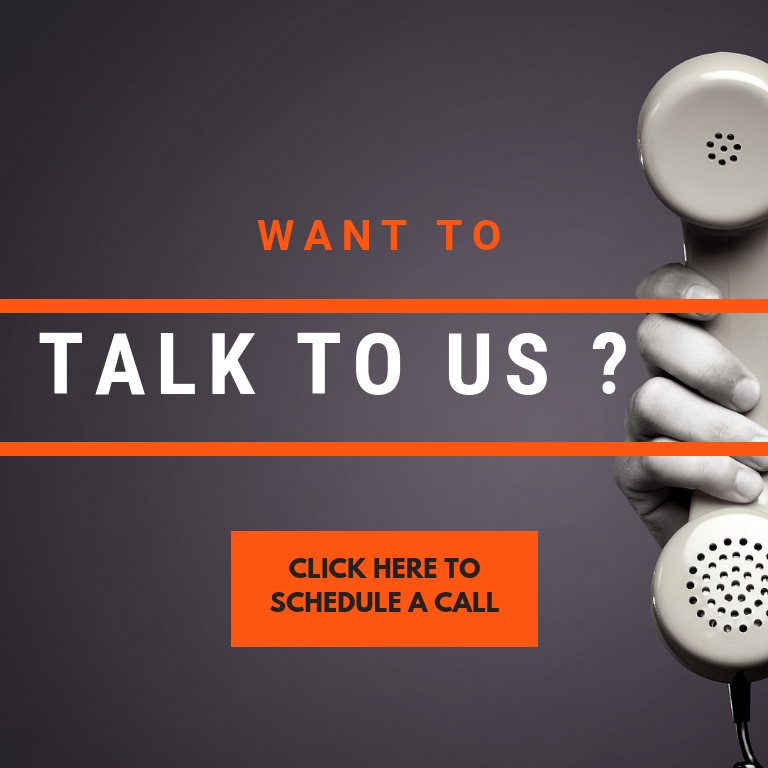 You can use it to leverage to get that next show or festival you want. But it’s not just get a PR agent and then you’re famous. AH: How has social media helped you to build your fanbase? Which platform do you think helps you the most? EL: At first I thought of it has a drag. It’s really just free promotion. A free way of getting new fans and connecting with people. I’ve connected with people all over the world. It’s been an amazing thing. It’s helped me expand my small community into a global family. The platform I think helps the most I think really depends on the post. On IG, photos and short videos work. On FB, Live videos. But email has actually been really good. I have a great response from email because I try to stay in touch once a month. AH: How have you used email marketing to mobilize your community, find new fans, and keep your current fans engaged? EL: Social media comes and goes, but if someone gives you their email that’s a form of trust. I’ve used that to bring fans in. I had a Noisetrade campaign which got 400 email addresses. Slowly building the list from live shows has been awesome. That way people can keep in touch to see when I have new music. AH: What would you say is a secret weapon in building your community/ fanbase? EL: I don’t know if it’s a weapon, per say, but consistency and engagement. If I’m there and they know they can come and say hey and see something on my socials, that’s really great. I do Folk Fridays on YouTube as a weekly series. People see that and know to come every Friday. On Patreon, I release a new song and video every month exclusively for my members there. It gives me a way to keep myself accountable. AH: You just released a creative crowdsourced video for Chasing Daylight, how did you 50+ of your fans to participate in the video? Wasn’t that time consuming? EL: Well, the initial set up was consuming. After that, people sent in their videos. I set up a google drive and split the song into 6 sections. People sent in different sections. It was a cool experiment, a great way to connect with the community. Now I have a direct line to people who have been in the video. AH: Your album, Way Out West just came out, what was your strategy for getting your current fans to take action and help spread the word about the album? EL: I had a video strategy on Instagram where I made short clips of each song and then fans would talk about their favorites. I also had a single come out before the album, a single come out with the album, and music videos come out after the album. I had a big album release party at Pearl St. Warehouse in DC. It’s all part of that push, and people are excited about it, so am I. It doesn’t just end there once the albums out. It’s the beginning of all the PR.